I’ve been holding out on wearing boots because I know that once the temperature drops, I will be wearing boots for the next 6 months. Well, the temperature has dropped and my boots had to come out. I couldn’t resist but to wear my over-the-knee boots as my first boot of the season. I just love them! They add so much to an outfit and look great with dresses. Lately, I’ve been really into sweater dresses and OTK boots combo. 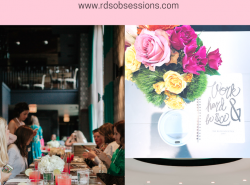 I’ve been seeing them a lot with other bloggers, and I just love the pairing! Sweater dresses and over the knees are definitely a killer combo! You look lovely, Rach! nice outfit. You are looking fab. Too chic; love the neutral layers here, doll! Too funny – this is the same reason that I've been avoiding my OTK boots, too. The season is long enough, there's no reason to rush into it. 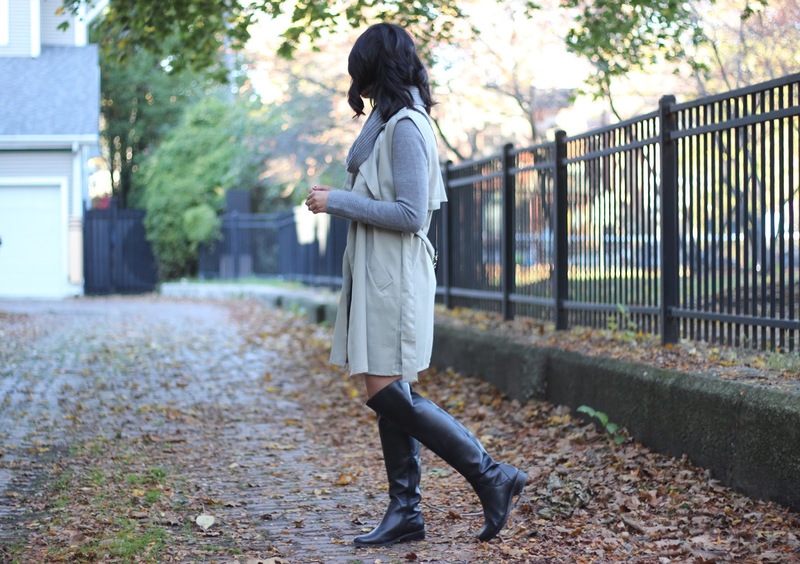 Loving how you styled the boots – that dress looks great on you! Love your layering – very chic! And I just love the way OTK boots look, these are gorgeous! So cute! I love the sleeveless vest with them! Thanks Irene! Thanks for stopping by! very nice dress, i love it. I love your cozy sweater dress and have a very similar vintage Coach bag! Such a cute outfit, I really love your dress with those boots! That sweater dress and long boots are wonderful together. Love this style! This fall look is amazing and I love the boots! love the jacket with no sleeves with the turtleneck dress! awesome look! those boots are just TDF! You look fantastic in this dress!! Love your knee shoes!! I've been loving the sweater dress and OTK combo too, and this look is fabulous! What a cozy trench too! Hey, I am wearong almost this exact same look in real life today! Love it! I know what you mean of holding off as long as possible. I'm trying to still wear dresses without tights as long as possible. What a gorgeous outfit! Absolutely love those OTK boots! Can't go wrong with a sweater dress & OTK combo – love this!!! This is the perfect way to wear a sweater dress. I'm going to have to steal this look from you! Nice post! The sweater dress looks awesome on you. yes, yes & yes everything about this outfit is a yes! Rachel, this is the PERFECT fall look! Love the sweater dress and those OTK boots! They look super comfy too! LOVE LOVE! The H&M sweater dress together with these OTK boots make a fantastic outfit! You look very pretty, Rach! I love this outfit head to toe! 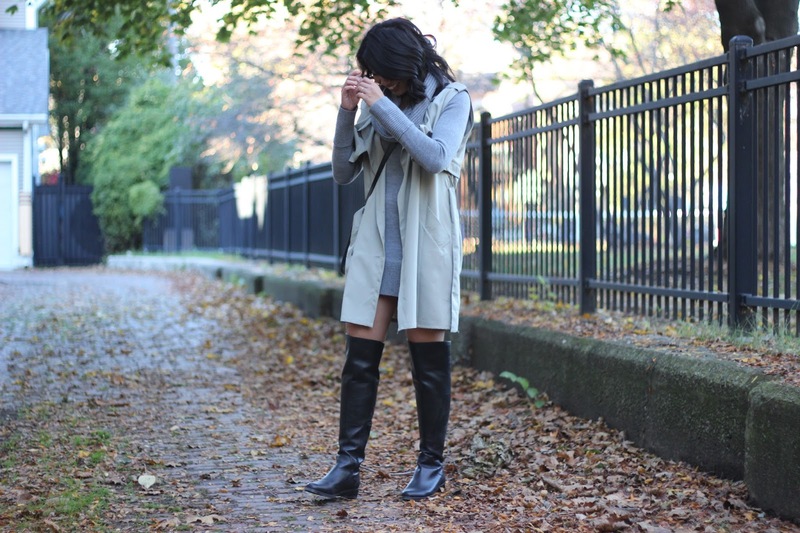 The sweater dress paired with the over the knee boots is such a cute look! I love a good dress and otk boot combo 😉 The sleeveless trench is a great addition! Thanks Izzy! Thanks for stopping by!